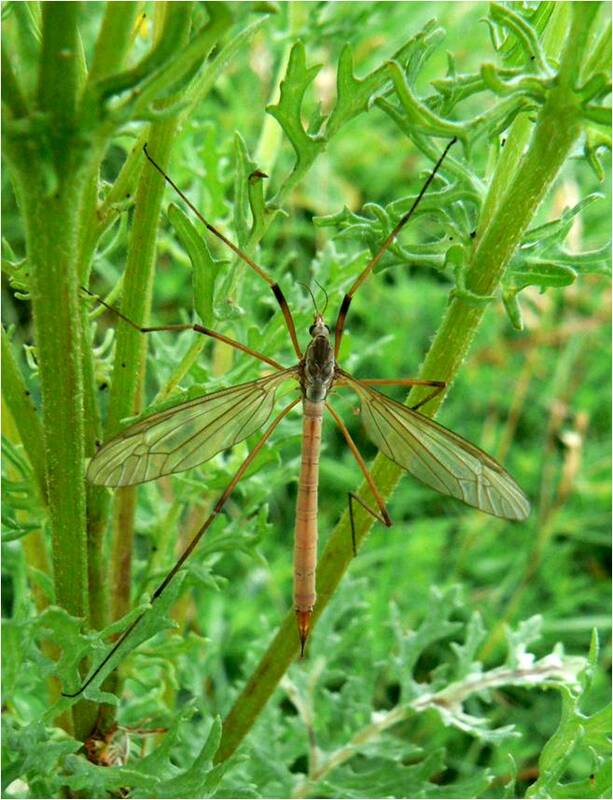 This is the insect to separate the entomological men from the boys: what do you call this, a daddy long-legs, a crane fly or Tipula paludosa? The wings have brown markings along the front. Both males and females have a pointed tip to the abdomen. The females' wings (as here) are shorter than the abdomen. 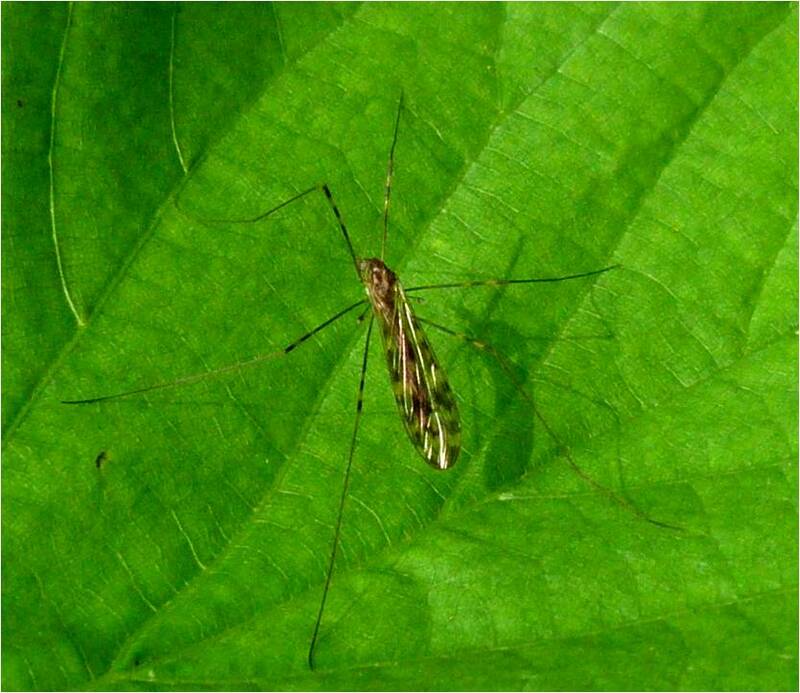 The Tipula oleracea is a very similar species and can only be distinguished under a microscope. 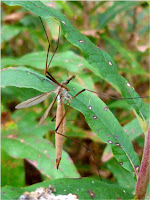 The photo on the right was taken with a macro lens and demonstrates the crane fly's compound eyes made up of thousands of ommatidia, which together make up one complete picture. 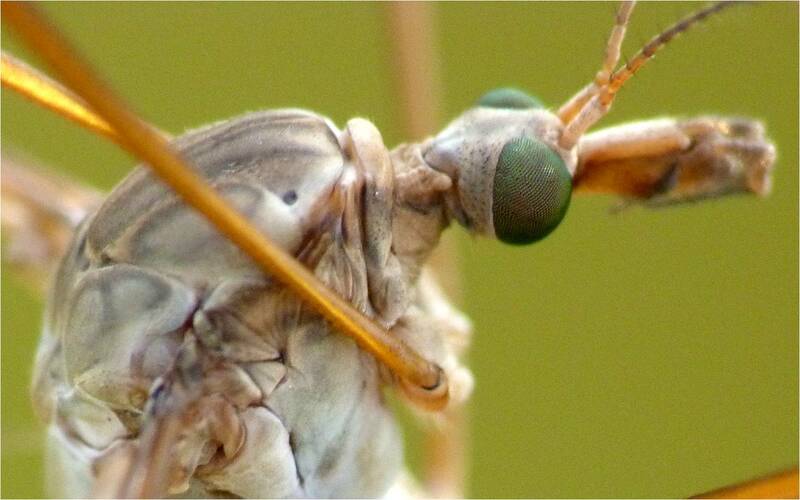 Compound eyes are excellent at detecting motion. 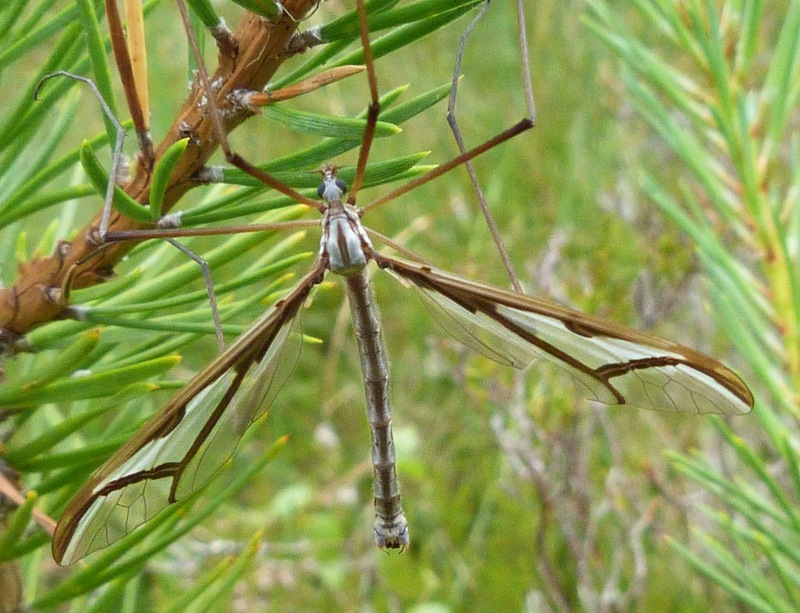 The distinguishing feature between this crane fly and the last one, Tiplua paludosa, is that the first 2 segments of Tipula paludosa’s antennae are brick-coloured whereas the first 3 segments of Tipula oleracea are brick-coloured. I’m not convinced that’s any real help, but never mind. You can see that this one has not come into contact with young boys as yet, as its six legs currently remain intact. And no - once a leg's been pulled off, it doesn't grow back again. I can't tell you how long I've been trying to find one of these - literally years and when I did find this one, it was unfortunately disappointingly quite small, particularly as it is the UK's largest fly. I found it early in the year, late May, so perhaps it is still young. 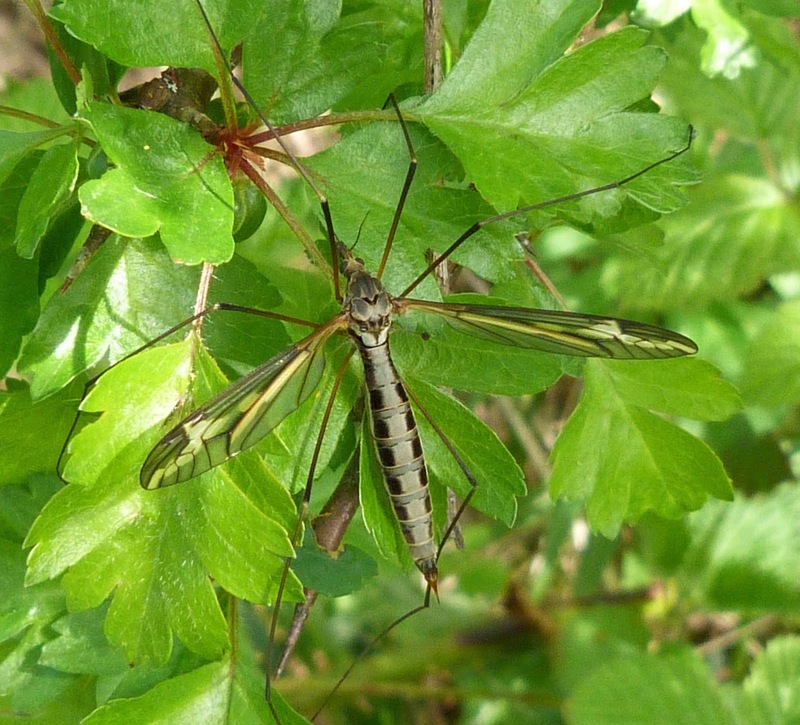 However, unlike many crane flies that are quite difficult to tell apart, Tipula maxims (is that how you say it?) are unmistakable due to the very distinctive dark marking on its wings. 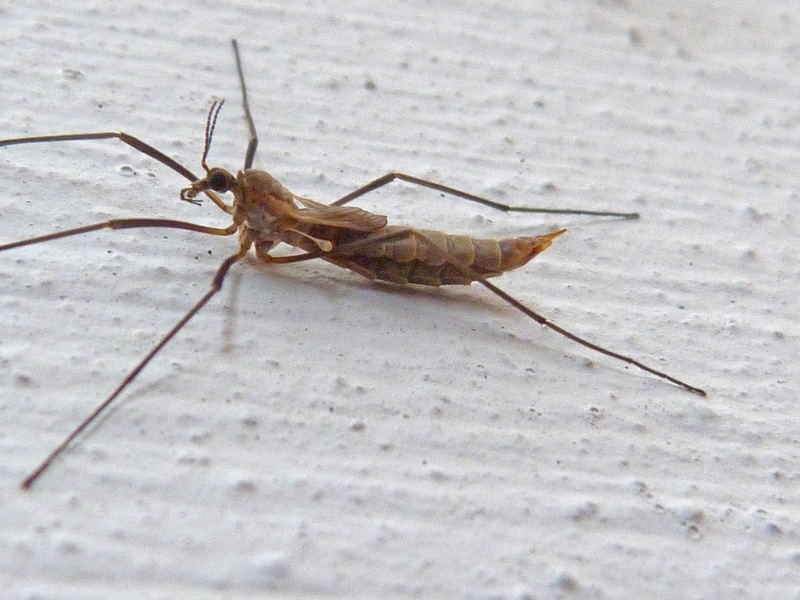 You can tell this is a male due to its clubbed abdomen with females having a pointed tip for laying eggs. These are apparently common throughout the UK, but given it's taken me about 6 years to find one, I'm not convinced. 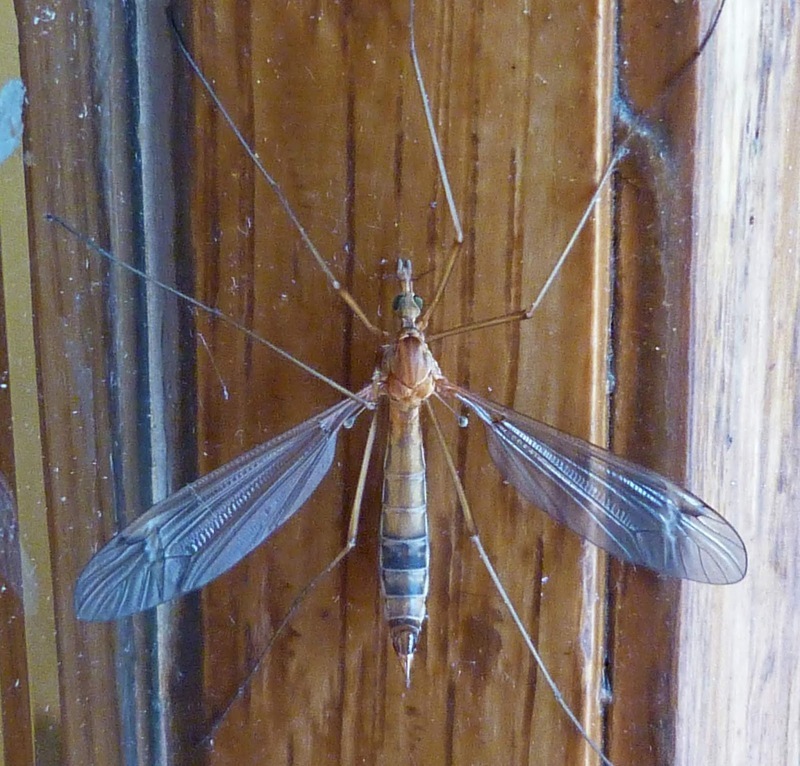 A huge crane fly. When I first spotted this from a distance I thought it was a strange looking dragonfly. 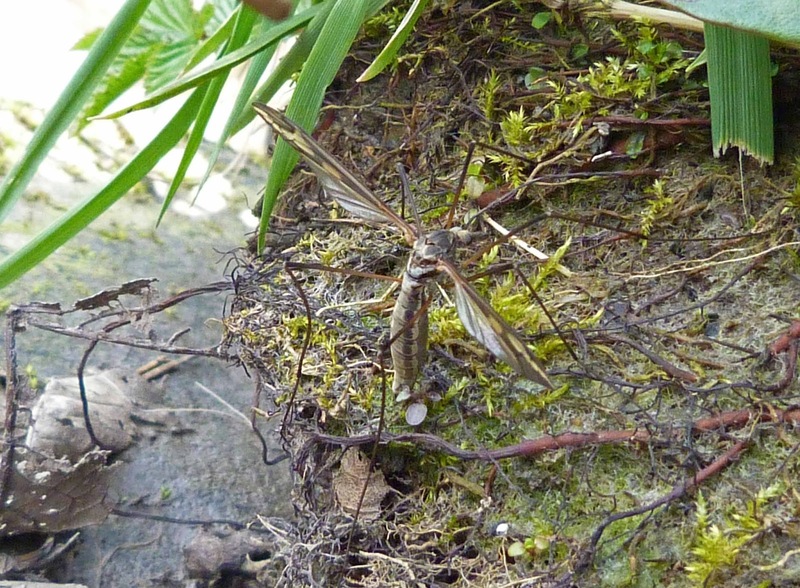 Then when I got closer, I thought it must be my long sought after Tipula maxima because of its size. 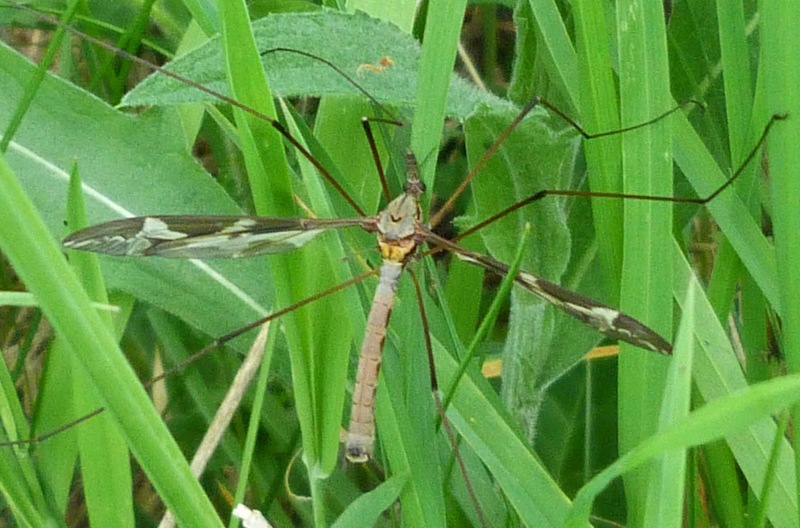 Unfortunately, it wasn't and apparently Tipula maxima is in fact even larger than these, which is hard to believe. 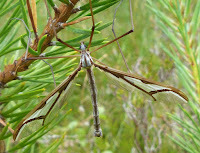 Anyway, the wing pattern clearly makes this Pedicia rivosa instead due to the brown markings on its veins only, whereas Tipula maxima has brown shaded areas across its wings. 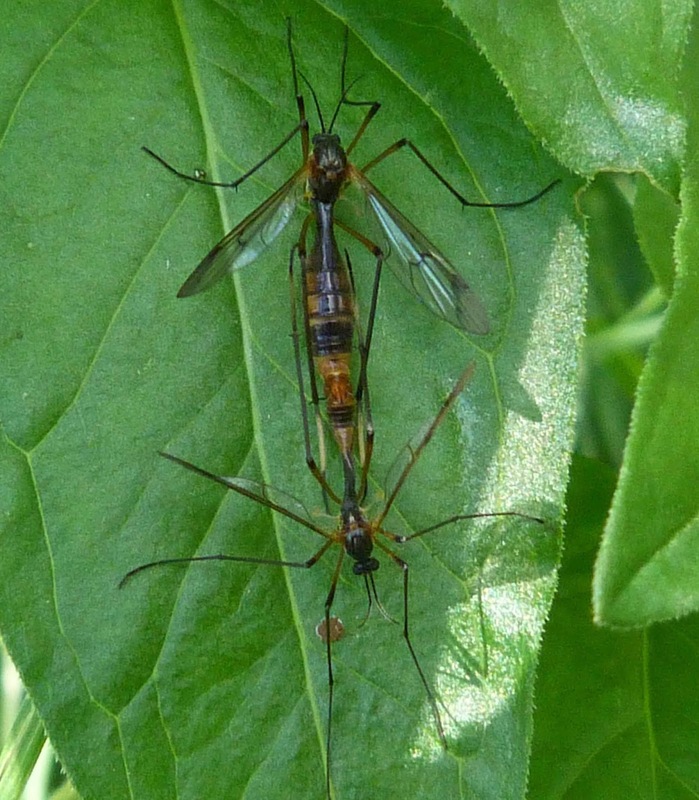 I assume the 'club tail' of the crane fly on the left, makes it a male, and the point at the end of the cranefly on the right is the egg laying ovipositor of the female. 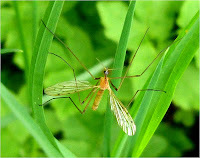 The strong orange colour of this crane fly is quite distinctive. The photo in the left is clearly a female with her pointed ovipositor for laying eggs and the photo on the right a male with its reddish clubbed 'tail'. However, there are a number of similarly coloured species, so I can't be certain of the identification of this one. The wings also seem to have a single small dark smudge near their tips, a whitish line along beside the smudge and its eyes are green. 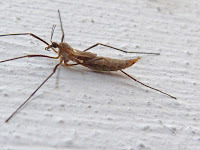 It is also one of the larger crane flies I have come across. Ok, I confess. I'm very please with myself for finding this one - it's an absolute stunner and I don't think they're terribly common in Scotland, although they appear to be much more common down south. 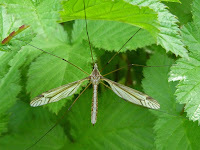 Crane flies tend to be a bit ten to the penny to be honest, but this one is really distinctive and beautiful. Obviously, it's the wings you notice first. They are yellow with unusual doodle-like brown markings and each wing has a bullseye-like marking towards each wing tip. 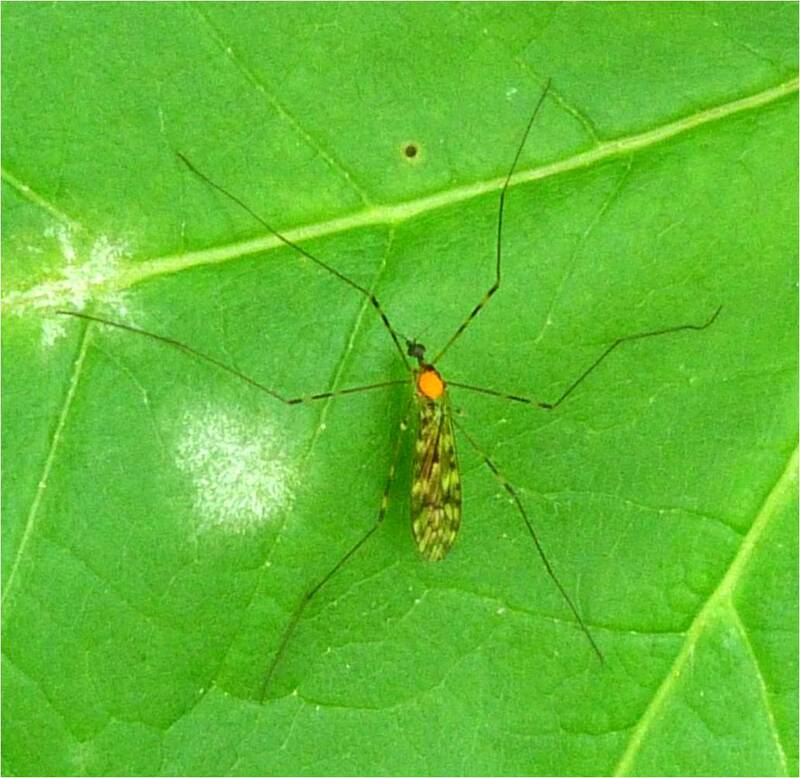 The abdomen has brown and white stripes and the legs are yellow with black bands. It was found in a very wooded area which I understand is where they are most commonly found. Quite a common insect. 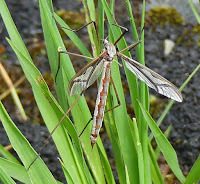 The speckled pattern on the wings makes this crane fly quite distinctive. 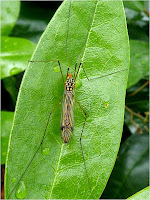 The upper part of the legs are also stripy. 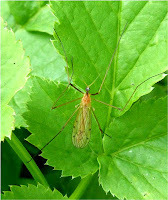 At rest, their wings are folded over the abdomen. Some crane flies attract mites and you can see an example of this on the crane fly on the right. It's not very clear but that pinky-orange dot is a mite. Sometimes there can be quite a number of mites attached to the crane fly. 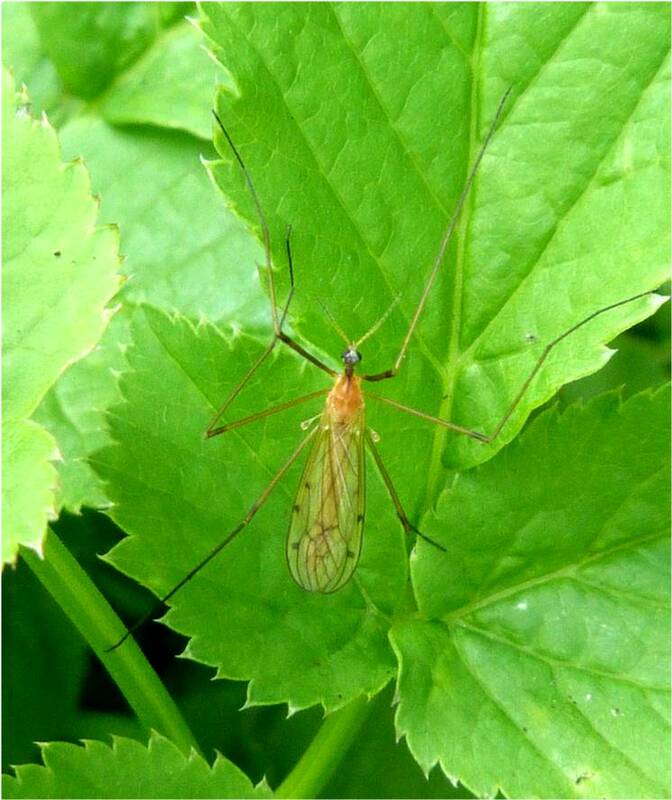 Some mites are 'phoretic' and have a 'symbiotic' relationship with the cranefly i.e. 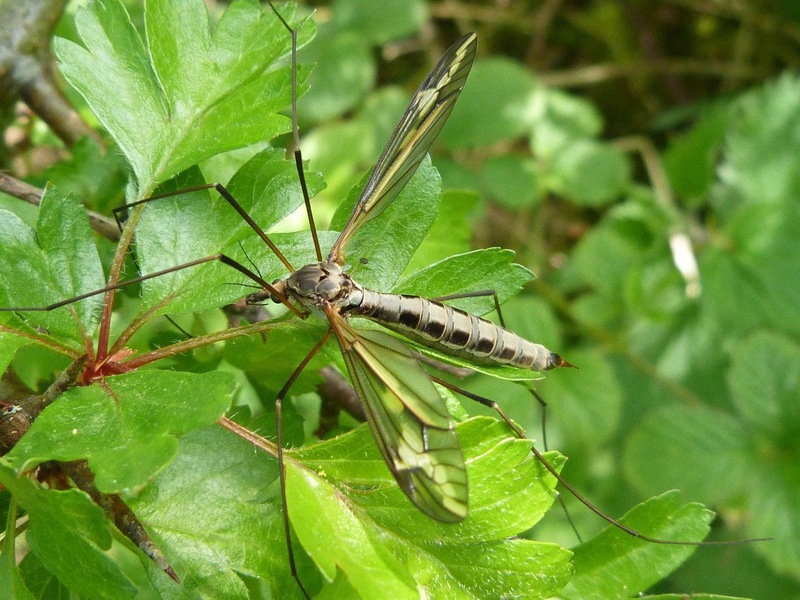 they just use the crane fly as transport by hitching a ride on it, whilst other mites are parasitic and feed on the crane fly's body fluid. 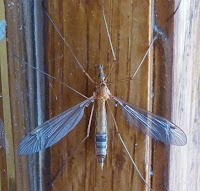 It was incredibly hard to identify this crane fly and I am not 100% convinced I'm right. I don't know why the usual reference guides don't include this one, as in Scotland, these appear to be more abundant than the common Tipula paludosa. 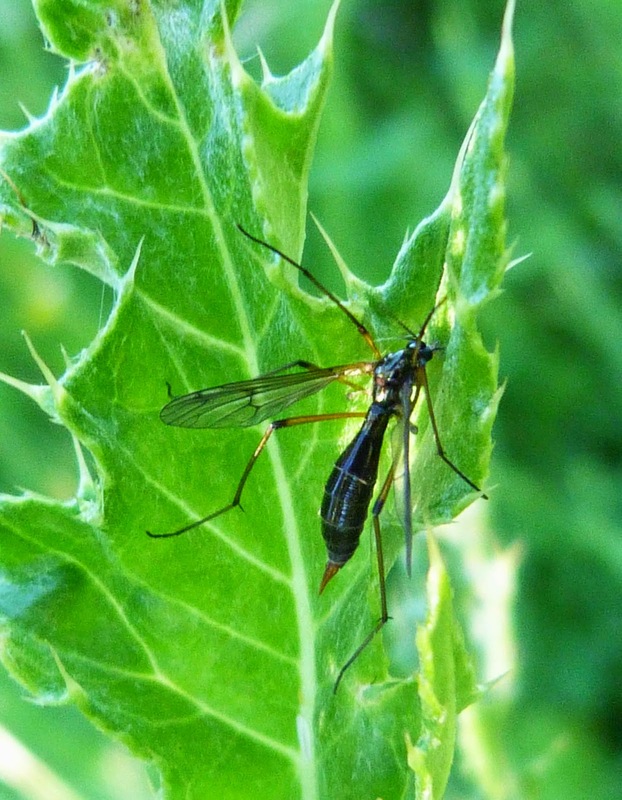 The females of this species have the pointed ovipositor to deposit her eggs, whereas males have a broad, clubbed end to their abodmen. The grey colouring in the abdomen is quite distinctive which sometimes, as here, has a dark central line running down it. The thorax is stripe (just about visible here). 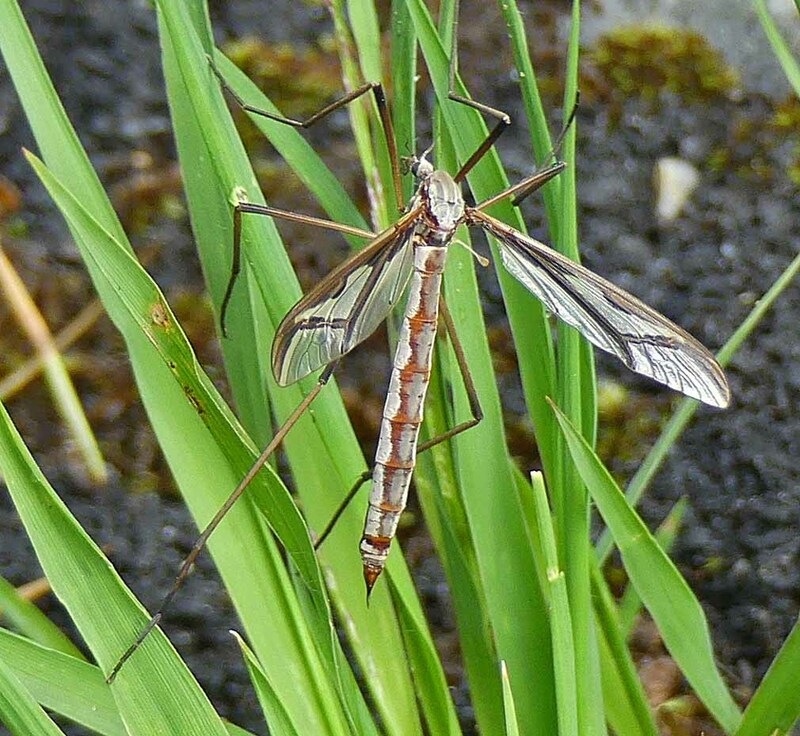 Without tying to sound like a stuck record, depite this crane fly haveing quite distinctive markings, it was still pretty difficult to identify. The wings have black markings running through them and whitish-yellow patches near the wing tips. 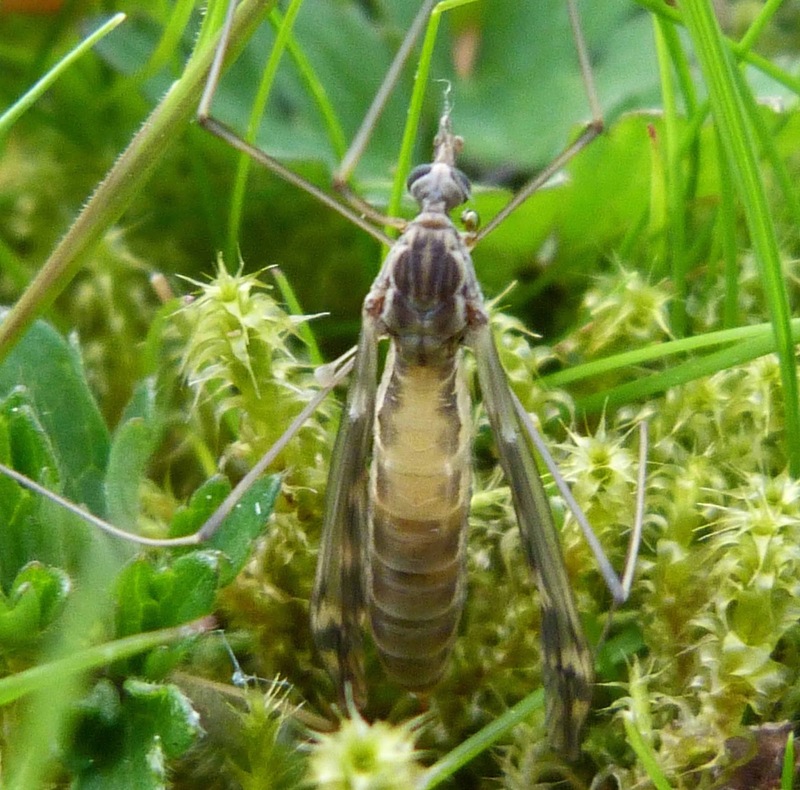 The most obvious feature, however is the whitish line running down the dark brown abdomen. The tip of the female's abodmen (as here) tapers to a point, whereas the male has a blunt or clubbed end. 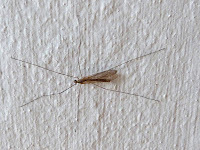 This is one of the first insects I've seen this year and it's only April. This crane fly is very similar to the one above, but there's not such an obvious 'stripe' down its black and as you can see from the photos at the top, it's wings have a bit more of a distinctive black and yellow pattern, which is actually quite striking in 'real life'. 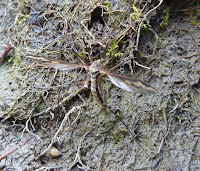 Like the crane fly above, this crane fly is also often seen beside muddy streams. 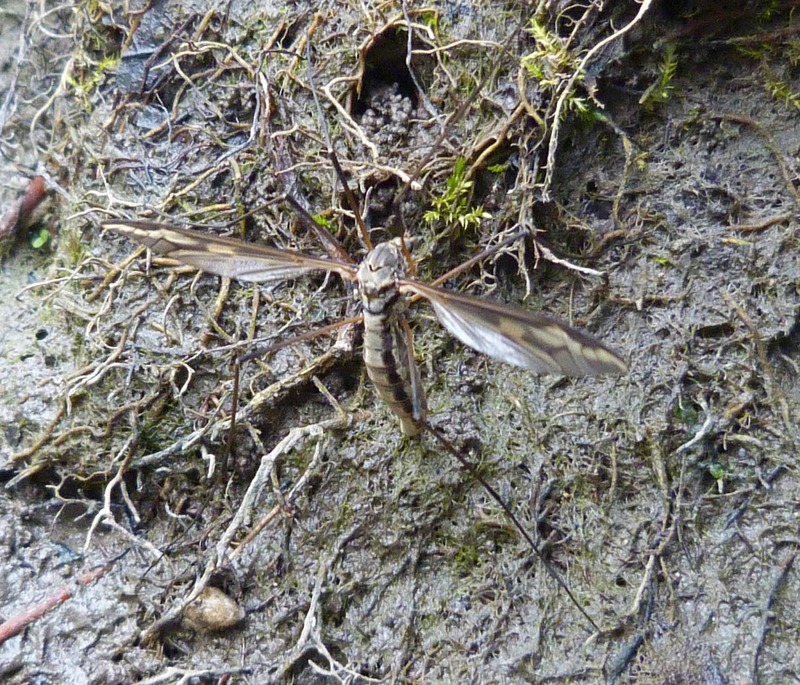 The photos on the bottom shows the crane fly dipping her ovipositor into a muddy patch to lay her eggs. 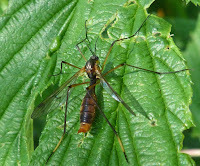 A crane fly that would be rather dull were it not for its extrodinary black and yellow thorax. 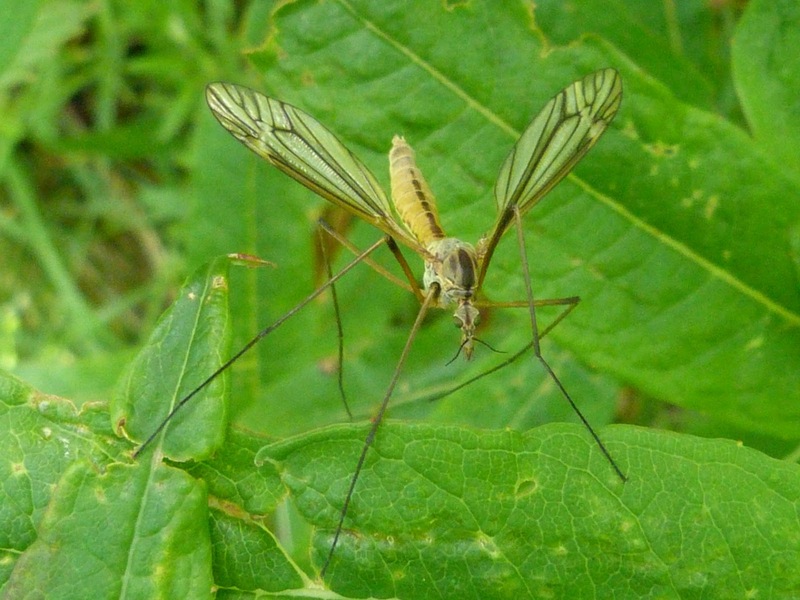 As here, this crane fly rests with its wings folder flat over its body, which makes its bright yellow abdomen with a black vertical stripe on each segment difficult to see. I think this may be a female, as you can just make out a red pointed tip to its abdomen. This species has a dark smudge on the wing which distinguishes it from the very similar looking Nephrotoma appendiculata. 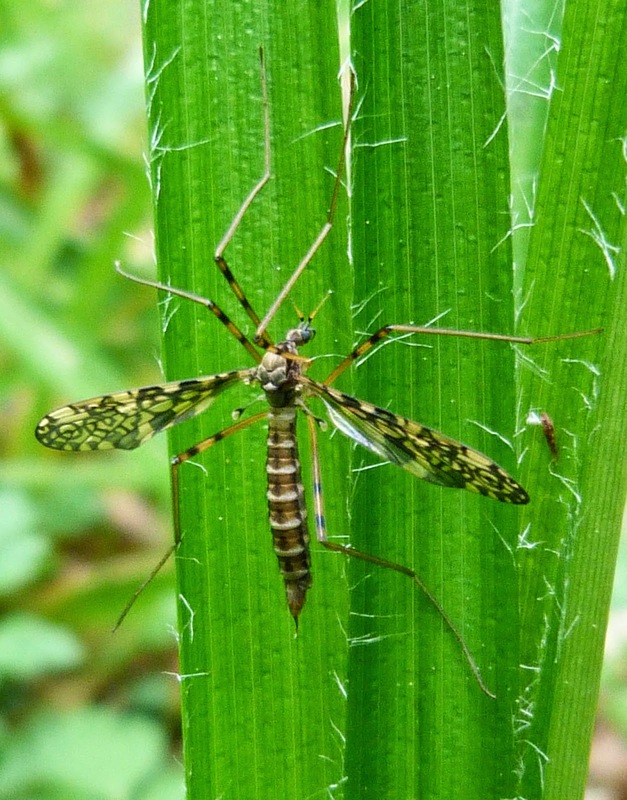 A strikingy bright yellow crane fl y with a dark brown line down its thorax and abdomen and distinctive wing marking. 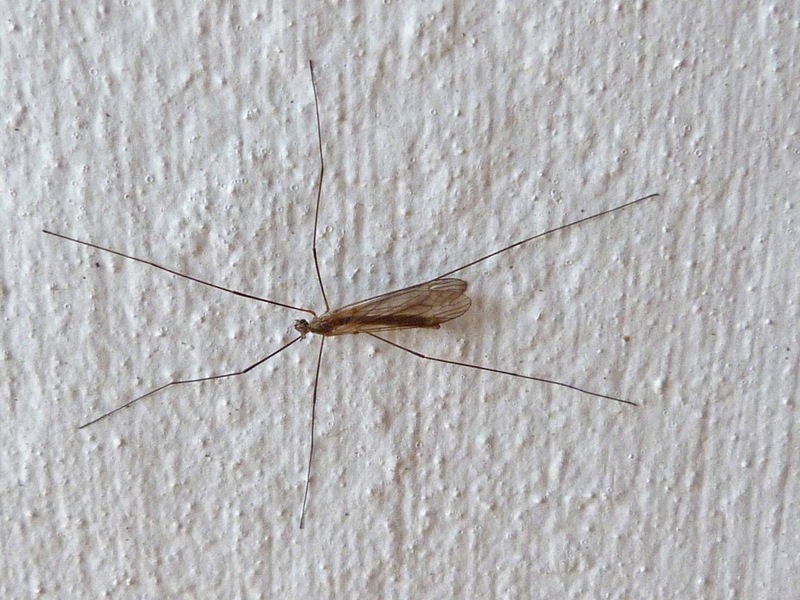 It doesn't like coming into houses as much as the common crane fly. It looks rather like the Nephrotoma quadrifaria picture above but without the quadrifaria's bright yellow and black thorax, which clearly this one doesn't posses. 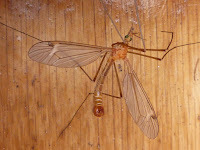 A very distinctive orange crane fly with three black dots on the edge of each wing. The thorax is a bright orange whereas the abdomen is a more dirty orange colour. Its legs are brown with dark bands. 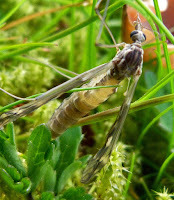 It seemed smaller and more delicate than the more common cranflies and was rather nervous of the camera. There does not appear to be a lot of infomation about this species of cranfly, so if anyone knows any interesting facts about it, I would be delighted to hear about them. This is similar to the phantom crane fly above, but has orange on the abdomen and its tip and the pale yellowish band on its hind legs is what gives it its Latin name Ptychoptera albimana. Again, I must thank www.ispotnature.org.uk for helping me to identify this one. 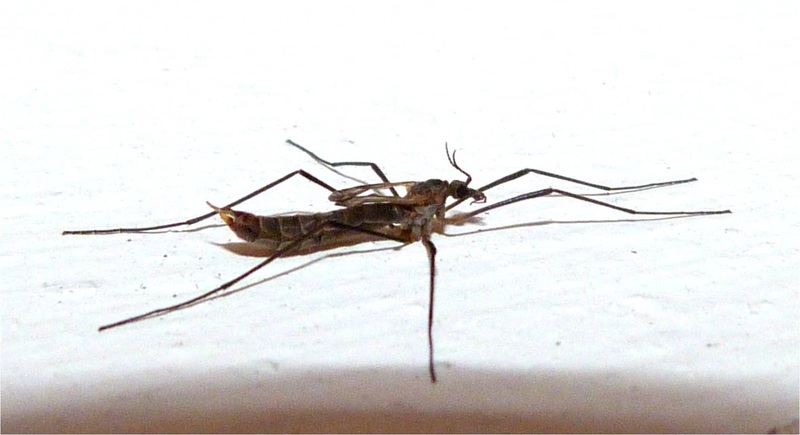 It's not easy to see from the photo, but I think the phantom crane fly in the left photo is a male as it has a 'blunt' tip to its abdomen unlike the phantom crane fly above which has a pointed tip for depositing eggs. 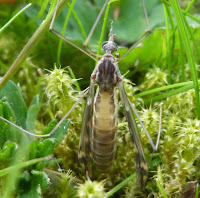 This crane fly looked like it was growing out of the ground when I first spotted it as the tip of its abdomen seemed to be buried in the earth. 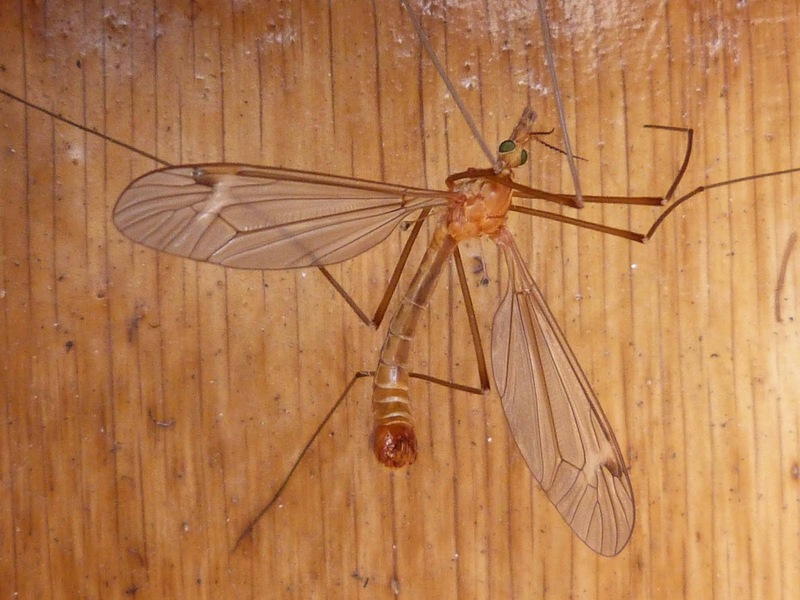 I think the term for what's happening here is pupating - where the crane fly pupa becomes an adult. 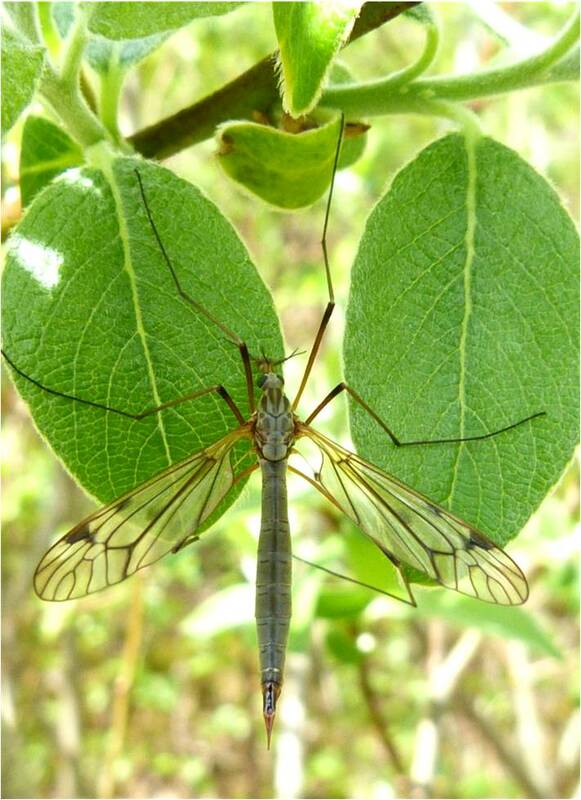 Crane flies go through complete metamorphisis. 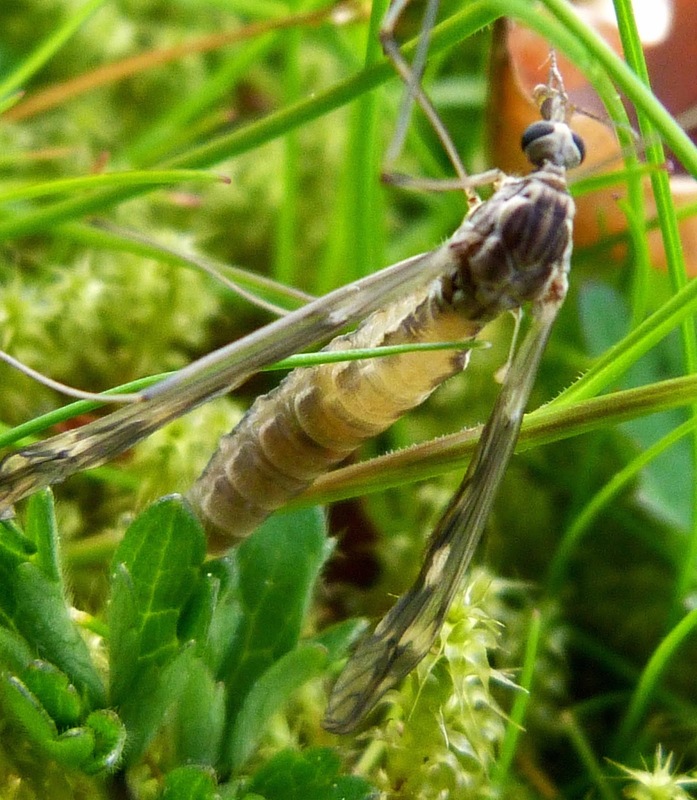 The adult female lays her eggs in water or moist soil which hatch into larvae after one or two weeks. 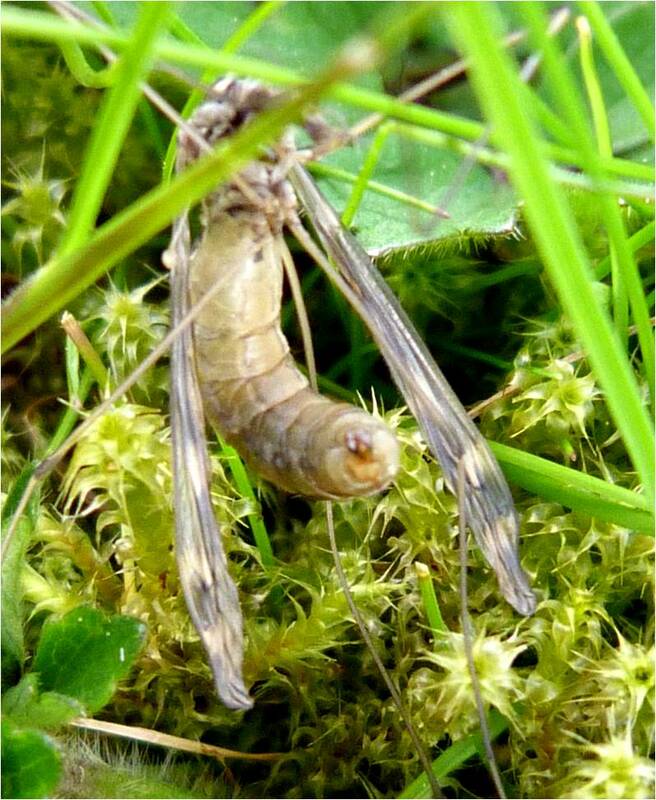 The larvae are commonly known as 'leatherjackets' which look a little like brown or cream-coloured slugs. 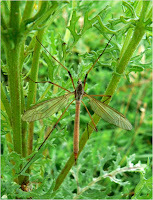 The crane fly larvae can live up to a year and the 'terrestrial' species (i.e. land based rather than water based, or 'acquatic' species) overwinters in the soil - as in the case here. 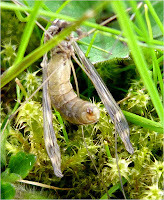 The crane fly larvae then pupate for a week or two before becoming fully fledged adults. The adults eat little to nothing and only exist to mate, dying a week or two later.